Light gray novaculite from a Montgomery County quarry. Tyler Stumpf documents a Polk County novaculite quarry site. Erosion-resistant novaculite outcrops on mountain ridges. Vanessa Hanvey records a novaculite quarry trench feature. Novaculite “Gary” style dart points, like this example from Arkansas, have been found at the Poverty Point site in Louisiana. 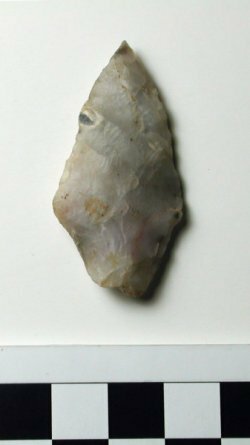 This website is a virtual comparative collection to aid in the identification of the raw materials chipped by Native Americans into sharp-edged tools in the past. Here you will find descriptions and photographs of samples of novaculite from quarries across the Ouachita Mountains, as well as available information on visual and chemical characteristics of the raw material. We show the variability in novaculite within and between quarry sources. This section of the website focuses on the sources of novaculite in the Ouachita Mountains, and gathers and presents information on the distribution of novaculite artifacts beyond this local area. Even before its commercial use for whetstones, novaculite was important to people here for toolstone. Indians living in what is now Arkansas quarried novaculite from sources on mountain ridges, leaving behind pits and trenches, battered outcrops, piles of chipping debris, and quarry tools such as stone hammers. Partly worked pieces of novaculite were carried to workshops and villages where they were made into a variety of stone tools. Novaculite boulder and chipping debris in quarry trench, Montgomery County, Arkansas. Archeologists are interested in learning not just about the tools and artifacts left behind, but what they tell us about how people lived in the past. We can learn about ancient trade networks and about interaction between Indian communities over thousands of years from analysis of the location and distribution of novaculite artifacts. 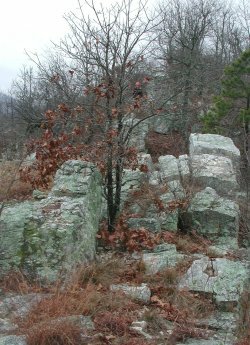 Novaculite outcrops in the Central Ouachita Mountains in western Arkansas and eastern Oklahoma, along what geologists refer to as the Benton-Broken Bow Uplift. The Arkansas Novaculite Formation is made up of beds of massive novaculite, with interbedded chert and shale. Layers of novaculite rock, tilted during mountain formation, are exposed on ridge-tops in the Ouachita Mountains. The Ouachita Mountains are one of the physiographic regions of Arkansas and Oklahoma. The Arkansas Archeological Survey has records of more than 120 novaculite quarries that have been documented as archeological sites in Arkansas. Most are found in Garland, Hot Spring, Montgomery, and Polk counties. Many are located on U.S.D.A. Forest Service lands in the Ouachita National Forest. 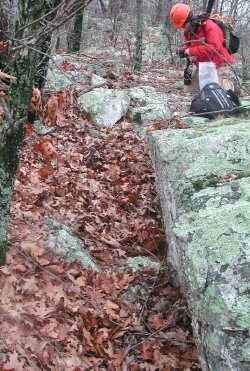 You may come across evidence of novaculite mining while hiking in the Ouachita Mountains. Remember that it is against the law to disturb archeological sites on state and federal lands. It is important to preserve and protect archeological sites such as novaculite quarries that can tell us the unwritten history of quarrying and mining in Arkansas. Quarry pits and trenches, hammerstones for breaking up the rock, and novaculite pieces from initial chipping are tangible evidence of aboriginal activity at these sites. We have much to learn about this ancient industry and about Indian history from these places. Help us to preserve these significant archeological sites by leaving artifacts where they lie. Collecting and digging damages these important historic places. Please observe and learn, photograph and explore, but do not remove pieces of novaculite. Join others interested in archeology and history through the Arkansas Archeological Society. There are two main sources of novaculite. Bedrock sources are beds of massive novaculite that are part of the Arkansas Novaculite formation. Geologists describe three divisions of this formation, which together may be up to 950’ thick. Massive novaculite is found in the Upper and Lower Division. 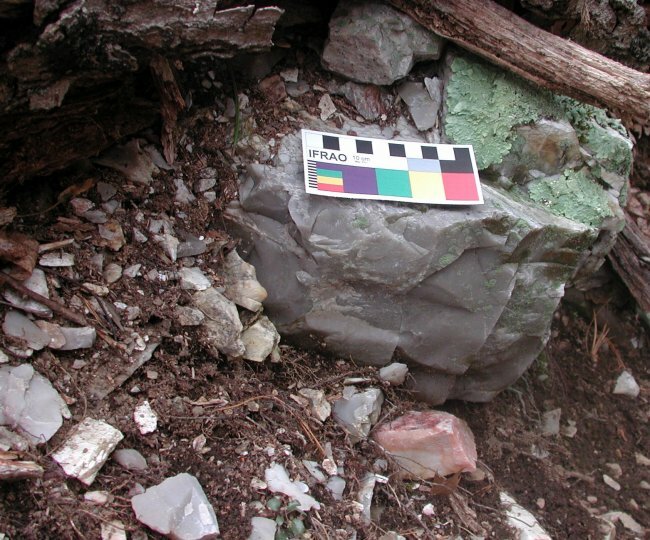 Indians quarried novaculite from bedrock sources in the Ouachita Mountains, especially in Montgomery, Garland, and Polk counties in west-central Arkansas. Mining novaculite from bedrock sources for whetstones became an important industry in the Hot Springs area in the 1800s and continues today. 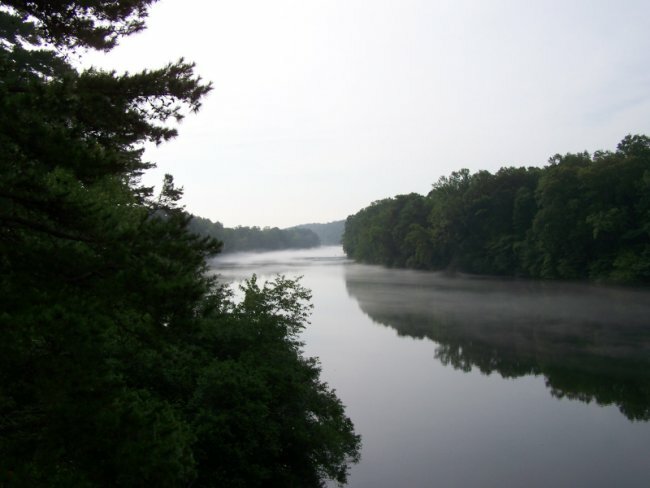 The Ouachita River is one of the main streams draining south from the Ouachita Mountains. Pieces of novaculite, eroded from bedrock sources and rolling down slopes, often end up in creeks and streams. Tumbled and worn, novaculite and other rocks make up gravels in river channels in this region. In the past, Indians looking for toolstone often used locally available novaculite cobbles. Archeologists identify cobble cortex on some novaculite from sites in the West Gulf Coastal Plain physiographic region. Our interactive map shows the counties where bedrock sources of novaculite occur (red), based on archeological records of quarry sites. The map also shows counties where novaculite artifacts have been reported (purple). Click on a county to see numbers of quarry sites and sites with novaculite artifacts in that county. We are building a picture of how widely novaculite tools were distributed across the region and through time. Did Indians Exchange Novaculite in the Past? 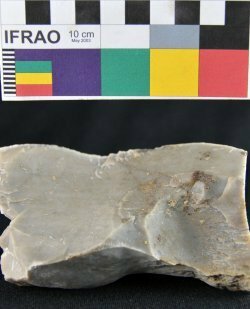 American Indians living in and near the Ouachita Mountains may have quarried toolstone from outcrops and worked it into bifacial preforms at nearby workshops and villages, trading the surplus to other people living in downstream communities. This would mean there was some degree of craft specialization. Or, Native Americans from distant communities may have come directly to the quarries to get their own toolstone. Novaculite may have been obtained from riverbed gravels either in the mountains or in coastal plain locations far from the outcrops. Novaculite shaped into bifacial preforms, like these from an archeological site in Garland County, would have been easy to transport. Archeologists want to know more about novaculite exchange networks in the past. For example, novaculite was one of several kinds of rocks from the Ouachita Mountains in Arkansas, transported to and used by people at Poverty Point in northeastern Louisiana between about 1700 - 600 B.C. How were these materials moved around across hundreds of miles in the past? Did people trade between communities or give gifts of novaculite tools? And did these trade connections and interactions between communities and between regions have an effect on the development of social complexity as seen by the impressive mound building at Poverty Point? 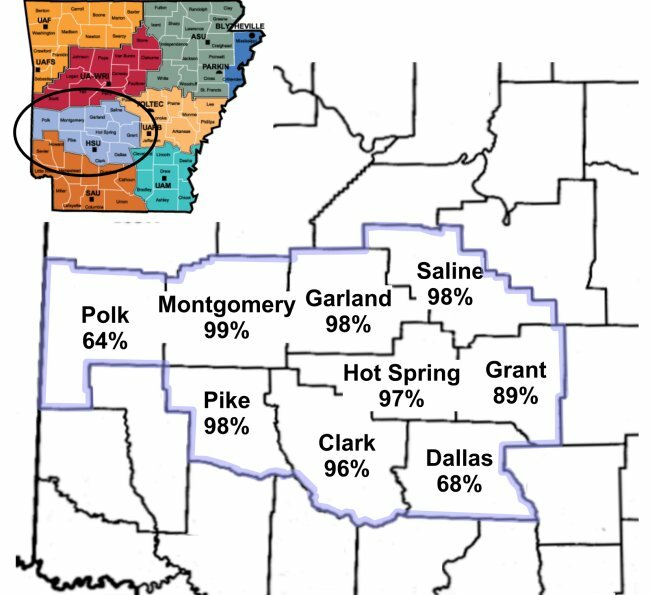 The Arkansas Archeological Survey is building a database of the geographical and temporal distribution of novaculite artifacts. We know that novaculite is ubiquitous in artifact assemblages from archeological sites in the Ouachita Mountains in Arkansas. 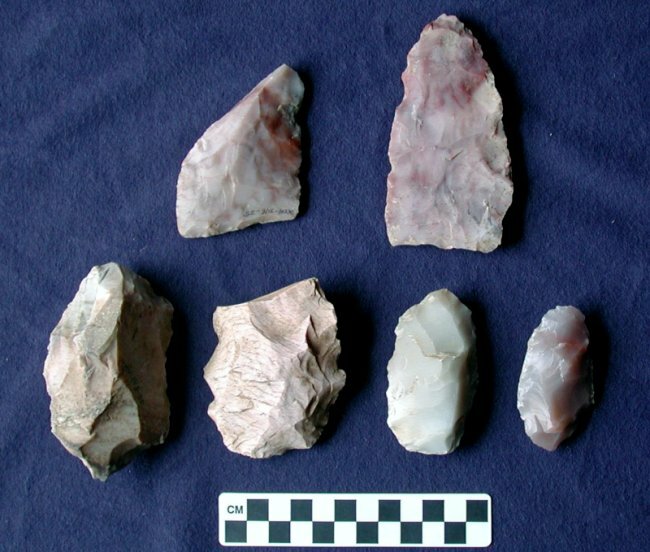 Novaculite artifacts are found on the majority of archeological sites with stone tools, for counties in the AAS/HSU Research Station area. In the western Ouachitas, where there were other useable cherts and silicified sandstone for tools, novaculite was used less exclusively. 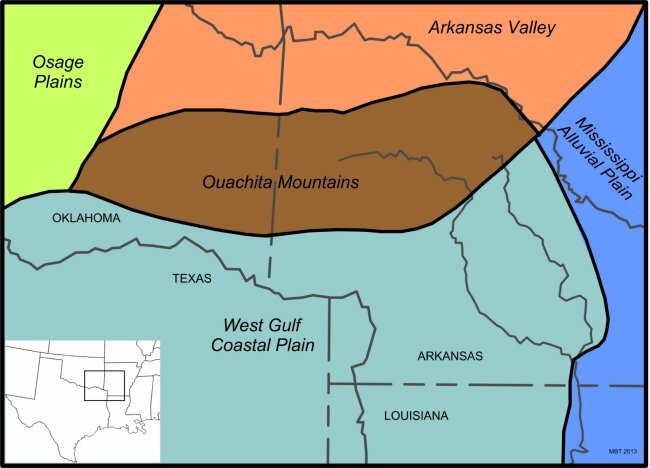 Novaculite seems to occur in lower proportions at sites north of the Ouachita Mountains as compared to sites to the south in the Gulf Coastal Plain. Novaculite tools have been documented at archeological sites as far away as Texas, Louisiana, and Mississippi. In west-central Arkansas, novaculite use spans the archeological sequence from Late Paleoindian through Mississippian periods. We need additional information on the timing of the novaculite use at more distant sites. We are looking for your help! We are interested in getting feedback from archeologists and other researchers who have identified novaculite artifacts at sites beyond the source region. If you have information on novaculite use in your area, email us at arkarch@uark.edu. We'd like to add your county to our map and learn more about novaculite distribution patterns and exchange mechanisms in the past. Angelo, Diana Rose (2003) Archeology of Buffalo National River: How We Know What We Think We Know: An Interactive CD for Use in Public Education. M.A. Thesis, Department of Anthropology, University of Arkansas, Fayetteville. Early, Ann M., editor (2000) Forest Farmsteads: A Millennium of Human Occupation at Winding Stair in the Ouachita Mountains. 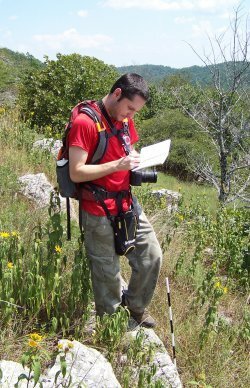 Arkansas Archeological Survey Research Series No. 57, Fayetteville. Gibson, Jon L. (2000) The Ancient Mounds of Poverty Point: Place of Rings. University Press of Florida, Gainesville. Hemmings, E. Thomas (1982) Human Adaptation in the Grand Marais Lowland: Intensive Archeological Survey and Testing in the Felsenthal Navigation Pool, Ouachita and Saline Rivers, Southern Arkansas. Arkansas Archeological Survey, Research Series No. 17, Fayetteville. Perttula, Timothy K. (1984) Patterns of Prehistoric Lithic Raw Material Utilization in the Caddoan Area: the Western Gulf Coastal Plain. In Prehistoric Chert Exploitation: Studies from the Midcontinent, edited by Brian M. Butler and Ernest E. May, pp. 129-148. Center for Archaeological Investigations, Occasional Paper No. 2, Southern Illinois University, Carbondale. Rolingson, Martha Ann (2012) Toltec Mounds: Archeology of the Mound-and-Plaza Complex. Research Series 65, Arkansas Archeological Survey, Fayetteville. Wyckoff, Don G. (1968) The Beaver Site and Archaeology of the Broken Bow Reservoir Area, McCurtain County, Oklahoma. Archaeological Site Report No. 9, Oklahoma River Basin Survey, University of Oklahoma Research Institute, Norman.